Apparently, every year, about a third of British people make new years’ resolutions. But how many of those resolutions are maintained and are successful? According to various polls and statistics, 43% of people give up on their resolutions by the end of January, about 80% last until March, and in the end, only 5% are successful in maintaining them! Wow! that is a massive 95% failure rate! So, why do people make them, and why are they so difficult to maintain? A recent YouGov poll states that the most popular resolutions are about improving our health, with improved eating habits and exercising more being the most popular. Many others are about reducing stress in some way, with improved work/life balance, less time at work, better quality family life and making more time for ‘me’. Ultimately, improved diet and exercise can improve stress levels too. Of course, there is the popular to give up smoking. 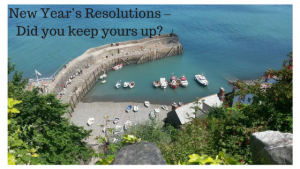 These may seem like easy enough resolutions, so why is there such a high failure rate? I think it’s because people are not specific enough and perhaps try to aim for more than one, which can become overwhelming. What is ‘reduce stress levels’? I think you need to have specific items with specific time scales. For instance, I will only eat 1 bar of chocolate and only on Saturday; I will eat an apple every day instead of a chocolate bar; I will go for a 10 minute walk every day for days 1 – 7 ; I will not turn on technology after 8pm and before 8am every day. You need to create a plan to stay on track and stop being influenced, in a non-positive way, by so-called friends. You need someone positive to be accountable to, and this is where hypnotherapy and NLP can help. With any therapy I do. The first consultation with the client is about finding out about their lifestyle, their stress levels, the root causes of their concerns and what they want to achieve in their sessions. As mentioned in my last blog What is Hypnosis? I stated that hypnotherapy can be used to help you, while you, the conscious person, takes actions alongside the hypnotherapy sessions, for a desired outcome, which is usually one of positive change. Hypnotherapy can help you achieve your desired outcomes. This is because we make the outcomes specific, relevant to you and realistic, even if it means we have to take them one step at a time. Hypnotherapy helps you to ‘see’ what you will look like or feel like, depending on your desired outcome and that’s why hypnotherapy can help you achieve your resolutions, no matter when you make them. I’m always happy to have a chat to see if we can help you.